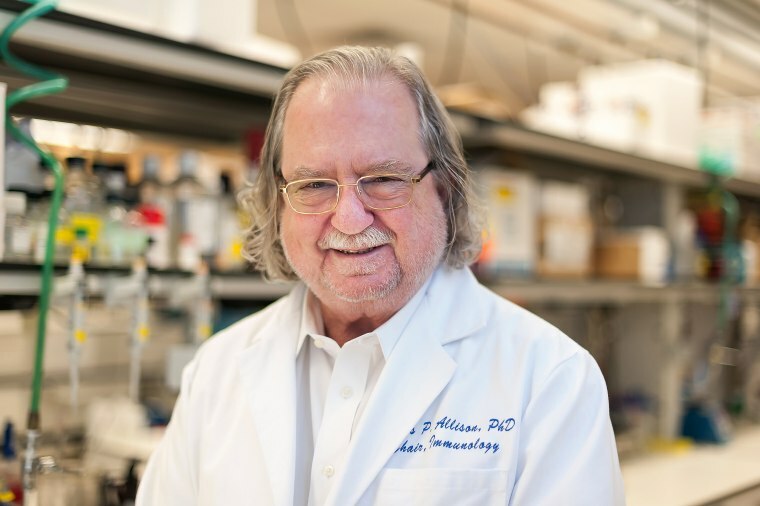 James Allison knew he was onto something: He and colleagues had found a compound that acted as a brake on immune system cells called T-cells. His colleagues wanted to investigate this protein as a gateway to treating autoimmune diseases such as rheumatoid arthritis. But Allison had another target in mind: cancer. What if you could uncloak cancer cells so the immune system could go after them? Allison, now at the MD Anderson Cancer Center in Houston, won the Nobel Prize in Medicine for his work on Monday, alongside Japan’s Tasuku Honjo. Their findings have led directly to the development of Yervoy, the first immunotherapy drug to hit the market for cancer, as well as Keytruda, the drug credited with keeping former President Jimmy Carter alive after his melanoma diagnosis. These drugs have transformed how cancer is treated and given hope to people with some of the most devastating cancer diagnoses. The drugs, most of which cost $100,000 or more for a course of treatment, are also making big money for pharmaceutical companies. But Allison struggled to get businesses interested in his discovery, said his longtime friend and fellow cancer researcher Lewis Lanier. “When he found it, he knew what he found,” Lanier, who studies cancer immunotherapy at the University of California, San Francisco, told NBC News. That was, in no small part, because Allison had personal experience with cancer. His mother, his brother and two uncles died of cancer. Allison’s work focused on cytotoxic T lymphocyte antigen-4 or CTLA-4, which tamps down the activity of T-cells. Controlling T-cells can be a good thing. Out-of-control immune cells can produce what’s called a “cytokine storm”, a deadly result of some infections, as well as autoimmune diseases such as type-1 diabetes, multiple sclerosis and rheumatoid arthritis. However, tumor cells can exploit this mechanism to escape the immune system as it protects the body against not only germs, but cancer as well. “After helping to show that CTLA-4 functions as a ‘brake’ on T cells and prevents them from exerting their disease-fighting ability, he was the first to demonstrate that blocking CTLA-4 with an antibody could prevent tumor development in mice as well as enable them to eliminate large, established tumors.” The Cancer Research Institute, a New York-based organization that funds cancer research and where Allison serves as head of the scientific advisory council, said in a statement. Similarly, Honjo worked with a protein called PD-1, which slows T-cells via a different mechanism. Interfering with these mechanisms is called checkpoint blockade, and it has spawned a whole generation of new cancer therapies, which can have spectacular results in a small subset of cancer patients. Carter was one of them. He was already in his 90s when he was diagnosed with melanoma that had spread to his brain. But surgery and a few rounds of Keytruda soon had him back on his feet and back doing the charity work that has been his passion since leaving office. Big Pharma did not at first see the same promise in these drugs that Allison did. They thought it was too risky. “Allison fought passionately to translate his findings into medicine for human patients," the Cancer Research Institute said. Even as Allison showed the potential benefits of using a monoclonal antibody, a lab-generated silver bullet designed to block CTLA-4, “many experts questioned whether anti-CTLA-4 could ever be successfully used in humans,” the University of California Berkeley, where Allison did some of his work, says in its history of cancer immunotherapy. But the ideas of Allison and Honjo were making waves in the then small world of immunotherapy. Through a series of personal connections, the work caught the attention of Medarex, a small biotech founded by scientists interested in harnessing the immune system. "Jim's major concern was he was very impatient because he really wanted us to go very fast," said Nils Lonberg, a former Medarex executive who is now senior vice president at Bristol-Myers Squibb. "He was frustrated trying to deal with pharma companies but he was also rightly suspicious that we would drag things out." Medarex took on the development of CTLA-4 into a commercial cancer drug. "We thought that Jim's experiment was the nail and we had the hammer," Lonberg said. Medarex also worked to develop one of the first PD-1 inhibitors, a drug called Opdivo. Bristol-Myers Squibb acquired Medarex in 2009 and brought both drugs to the market. It paid off for the drug giant. Ipilimumab, sold under the brand name Yervoy, costs $120,000 for a course of treatment. Opdivo goes for about $150,000 in the U.S.
“Without Jim’s persistence, checkpoint blockade would not exist as a new form of cancer therapy,” Lanier said. Yervoy got fast-track approval from the Food and Drug Administration in 2009. “Since ipilimumab’s development, it has been used to treat tens of thousands of patients with advanced melanoma, almost 20 percent of whom have remained alive a decade after treatment — an almost unheard of success rate in a cancer which claims the lives of nearly half of patients within a year,” the Cancer Research Institute said.